Concentrated animal feeding operations (CAFOs) represent everything that is wrong with factory farming and modern animal agriculture in general. A lengthy piece in the Chicago Tribune detailed the negative impact CAFOs have on human health, food safety, the environment, and family farming. Is it any wonder that, in upstate New York, residents of Schroeppel and the surrounding county of Oswego are fighting the efforts of Bion Environmental Technologies to build just such a factory farm in their area, subsidized with their tax dollars? Adriana Velez wrote an excellent post over at the Sustainable Food blog detailing the formation of a citizens’ group, Citizens for Family Farms, and their fight against the Bion plan. The group has a Facebook page, and now their own website to keep the community informed, too. There are countless reasons for people to oppose this project. For example, perhaps they do not want their water supply poisoned by waste generated by the planned CAFO. For those of us concerned with animal welfare, there is an obvious reason to oppose the Bion CAFO: Factory farms are essentially torture chambers. 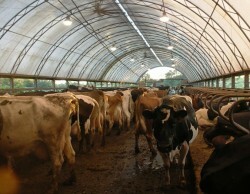 In a Washington Post editorial, Princeton philosophy professor Kwame Anthony Appiah wrote about “the stomach-turning stories about what goes on in our industrial abattoirs,” stories of cows “saved from the inevitable diseases of overcrowding only by regular doses of antibiotics, surrounded by piles of their own feces, their nostrils filled with the smell of their own urine.” That’s the fate awaiting the 72,000 cows who would be housed in six barns at Bion’s planned beef CAFO. According to the Farm Animal Rights Movement “more than 58 billion cows, pigs, turkeys, chickens, and other land animals … needlessly suffer and die every year in the world’s factory farms and slaughterhouses.” Unfortunately, no end to this mass killing seems at hand, and one Bion CAFO in New York is but a drop in the global bucket of blood. Yet that does not mean we shouldn’t oppose it. It’s better to save a few thousand animals from the hell of factory farms than to save none at all. While the resolution for the Bion factory farm was recently rescinded by the Town Board of Schroeppel, it was based on a technicality. Since the Town Board indicated an interest in continuing to talk with Bion, Citizens for Family Farms says, “We will need to remain vigilant and continue to educate ourselves and our communities.” Bion hasn’t given up yet, and neither will the Citizens until they’re sure that their community will remain CAFO-free. Take a stand against the proposed Bion factory farm. Do it for the health of the people of the region. Do it for the environment. And do it for the cows who face a nightmarish life and brutal death. You can help by signing our petition asking the New York State Farm Agency to not provide any subsidies for new CAFOs in the state.